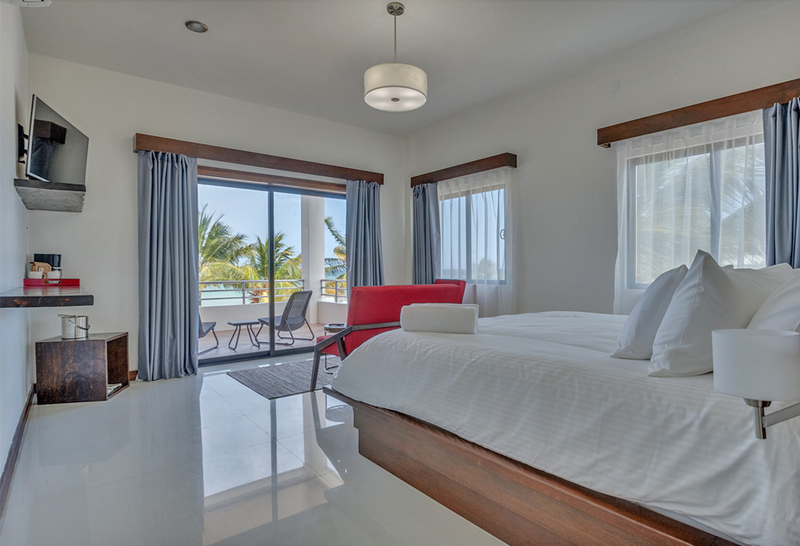 Within our chic hotel of pristine and unfettered elegance, lies the mesmerizing calmness of our Belize beachside accommodations, which evoke luxury and heavenly dreams. 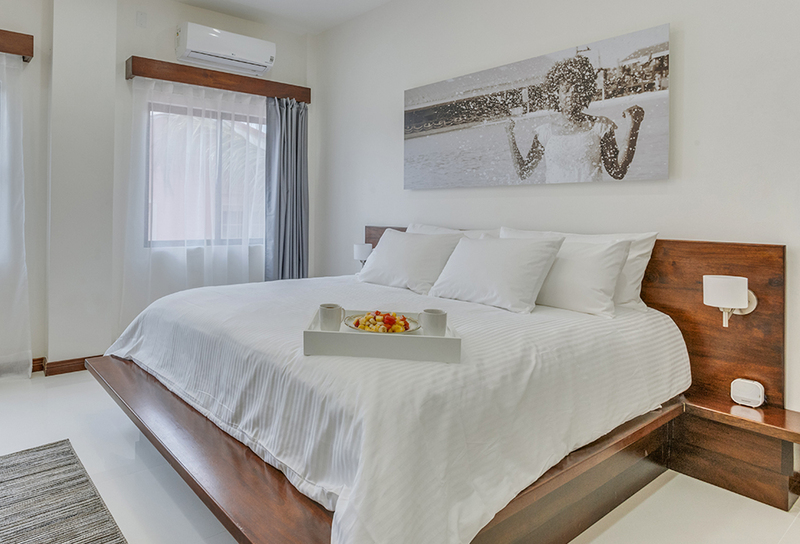 Deluxe cotton linens, ensuite oversized-bathrooms, hand-made local furnishings and inimitable artwork, adorn our 13-luxuriously appointed sea and garden view rooms in this Belizean haven. Located on the first, second and third floors, our 1-Bedroom Beach Suites are ideal for couples or small families who require the creature comforts and luxury amenities of a larger space. This open and airy room features an over-sized bedroom, en-suite bathroom, living area, pullout sofa bed, floor to ceiling glass doors, and kitchenette; as well as a modernly designed landscaped outdoor space, replete with chairs to enjoy the evening’s sunset and local village life. Located on the first, second and third floors, our 1-Bedroom Garden Suite is ideal for couples or small families who require the creature comforts and luxury amenities of a larger space. This open and airy room features an over-sized bedroom, ensuite bathroom, living area, pullout sofa bed, floor to ceiling glass doors, and kitchenette. Located on the third floor, our Exclusive Penthouse offers the perfect luxury escape for the esteemed traveler. 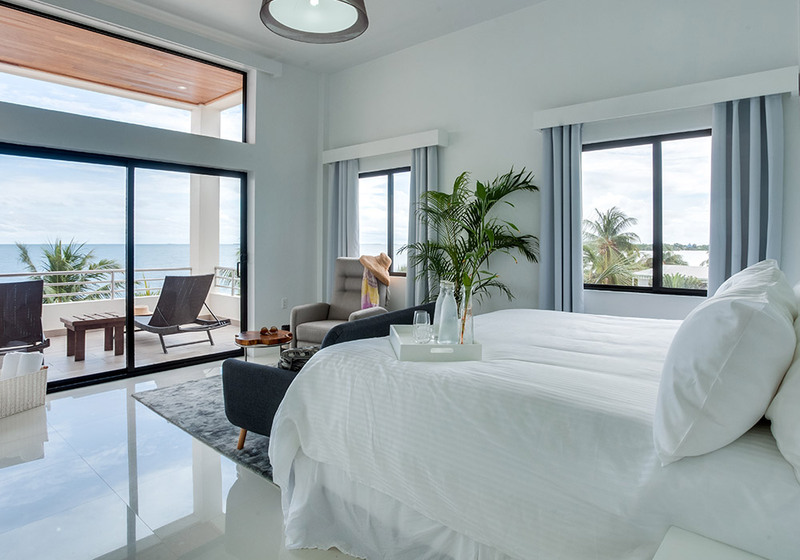 This modern and chic Penthouse has an abundance of open-air and handpicked furnishings by the First Lady of Belize- Kim Simplis Borrow. It flows out unto a well-appointed over-sized veranda to relax and enjoy the breathtaking views of the Caribbean Sea that envelopes you.